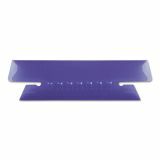 Pendaflex Hanging File Folder Tabs, 1/3 Tab, 3 1/2 Inch, Violet Tab/White Insert, 25/Pack - Hanging Folder Tabs allow you to customize your hanging folders equipped with 1/3-cut slots. Clear plastic tabs (3-1/2 wide) come with blank white inserts. Stagger the position of your tabs from folder to folder to keep each file heading in view. Tabs are large and angled for easy viewing."